Urban Homesteading is a movement that started over 100 years ago. It has been called Backyard Homesteading and even Hobby Farming. The different names it has been called all describe the same basic idea. Producing as much of the food eaten by the urban household as possible given the amount of yard or other space available for this use. This article will look at the history of urban homesteading and the dark chapter in it's history. We will also look at the various types of urban homesteading practices and skills that help make urban homesteading both popular and doable. Throughout the history of this earth it has been common for some people to grow a vegetable garden on their property. In American history it was 1920 before the census showed more people living in urban areas than in rural areas. 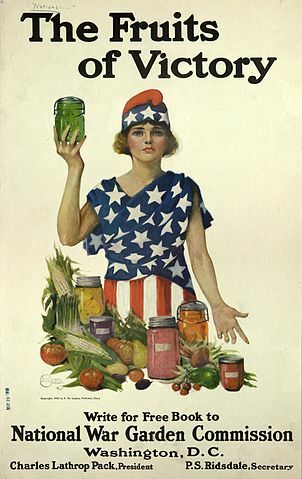 The beginning of what is today called urban homesteading in the U.S. was the WWI program of Victory Gardens. Other names for Victory Gardens were war gardens and food gardens for defense. Some sources credit George Washington Carver with promoting the idea of victory gardens. These gardens grew vegetables, fruit and herbs. They were typically in the yards of private residences and in public parks. 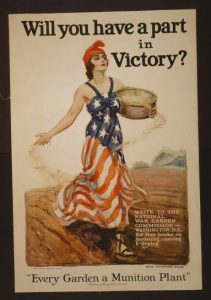 Victory Gardens indirectly helped the war effort by freeing up food to be sent to the soldiers on the front lines. They helped boost the morale of the gardeners who felt they were contributing to the cause. It was March 1917 when Charles L. Pack began the US National War Garden Commission and started the war garden campaign. Growing gardens on any available public and private lands resulted in some 5 million gardens producing some $1.2 billion of food by the end of WWI. The U.S. Department of Agriculture was behind the planting of Victory Gardens during WWII. 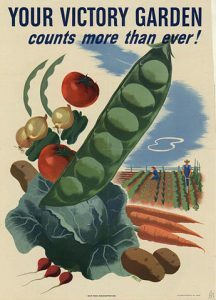 Almost one third of all vegetables produced in the U.S.during WWII came from Victory Gardens. A Victory Garden is like a share in an airplane factory. It helps win the War and it pays dividends too. 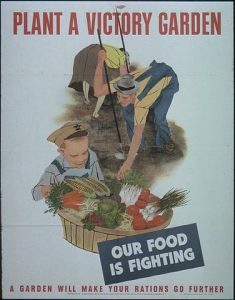 By May 1943 the U.S. had some 18 million victory gardens, 12 million in cities and 6 million in rural areas. The total produced in the Victory Gardens during 1944 amounted to between 8,200,000 - 9,100,000 tons of fruit and vegetables. That equaled the amount of commercial grown vegetables that year! A popular slogan during WWII was grow your own, can your own. Even First Lady Eleanor Roosevelt had a Victory Garden planted on the White House lawn. During and after WWII Burma Shave Company would post small signs along the highways to promote their men's shaving cream. One of these promotions mentioned victory gardens and not growing a beard. Victory Gardens are planted to win. But you can't grow one, on your chin! After WWII, Victory Gardens slowly started to disappear. However there are two victory Gardens that have been in continuous operation since WWII. They are Fenway Victory Gardens in Boston and Dowling Community Garden in Minneapolis. In the 1960's there began a back to the land movement. One of the examples of this movement that still exists today is The Farm located near Summertown, Tennessee. It was founded in 1971 by Steven Gaskin and some 300 Hippies from Haight Ashbury and San Fransisco. The back to the land movement began a migration of people from the city to the country. This movement spawned a series of books on homesteading. Along with this movement there developed a consciousness for the need to live in a more environmentally friendly manner. has replaced victory gardens but the concept is the same. Raise as much of the food one eats on lawns and other public places in urban areas. As we entered the 21st century there was a new awareness for growing as much of the food as one can in urban areas. Along with this new awareness came many well written urban homesteading books. As urban homesteading became more popular there arose Urban Homesteading Blogs that follow the journey of urban homesteaders who are repeating the victory garden model and adding new technology to their urban homestead. Whenever an idea becomes popular there are people who try to figure out a way to either capitalize on the idea or monopolize the idea. As urban homesteading became popular someone came forward with an idea to both capitalize on and monopolize the idea of urban homesteading. That someone turned out to be the Dervaes Institute located in Pasadena, California. The State of California Incorporation Papers listed them as a religious society headed by Jules Dervaes and his family. Jules claimed to be a minister of urban homesteading. They were just an enterprising city family who turned their one tenth of an acre city lot into an urban homestead. The idea the Dervaes family came up with was to trademark the terms urban homesteading and urban homestead. In theory, generic phrases and phrases that have been in general usage for decades can not be trademarked. Mother Earth News and many blogs and businesses had used these terms since 1979, well prior to the Dervaes Family's idea. Nevertheless, in 2007 the Derveas Institute applied for a service mark registration on the term urban homesteading with the U.S. Patent and Trademark Office. On June 2, 2009 urban homesteading was registered in the Supplemental Register of the Patent and Trademark Office. A service mark is something used to identify and distinguish the services of a certain provider. (Blacks Law Dictionary, 7th ed.). To receive federal protection, a trademark must be (1) distinctive rather than merely descriptive, (2) affixed to a product that is actually sold in the market place, and (3) registered with the U.S. Patent and Trademark Office. In its broadest sense the term trademark includes a service mark. Black's Law Dictionary, 7th ed. As can be seen, the term urban homesteading is not distinctive but merely descriptive of a particular type of homestead. Furthermore, the term urban homesteading as a service mark could hardly be affixed to a product that is actually sold in the market place. The only one of the three requirements met was that it was registered with the U.S. Patent and Trademark Office. (USPTO). In 2008, the Derveas Institute requested the USPTO office to trademark the term urban homestead. Urban Homestead was registered by the USPTO on it's Principle Register on Oct. 5, 2010. To be registered in the Principle Register a trademark must be inherently distinctive or it must have acquired enough secondary meaning. (Merges, et al, Intellectual Property in the New Technological Age, Third Edition). Urban Homestead was not inherently distinctive since it was a term used for decades as a description of urban residents who were planting Victory type Gardens and where they were allowed, to raise small animals. For some reason the USPTO must have believed that the term Urban Homestead had acquired sufficient secondary meaning? In February 2011 the Derveas Institute began sending letters to authors, bloggers and organizations using urban homesteading. The letters asked them not to use urban homesteading without permission or giving credit to the Derveas Institute for their trademark of the phrase. The Derveas Institute was successful in getting Facebook to disable accounts using urban homesteading. One of the Facebook pages was for Denver Urban Homesteading, the name of a small Farmers Market in Denver, Colorado. Another Facebook page disabled was one for authors of a book on Urban Homesteading. On November 4, 2015, after nearly a five year legal struggle, a U.S. District Court in California cancelled the trademark Urban Homesteading. During this time the Denver Urban Homesteading small Farmer's Market went out of business. They lost all their customer's contact information when Facebook disabled their account. No small business should have to go through five years of litigation to cancel a trademark that shouldn't exist. A small business cannot afford this burden. It took six years of time to cancel the Urban Homestead trademark of the Derveas Institute. In March 2017 the Law Firm of Winston and Strawn and the Electronic Frontier Foundation were successful in getting the USPTO to cancel the Urban Homestead trademark. The words and phrases we use everyday to describe basic activities should never be the exclusive property of a single person or business. It took six years, but we're proud that this terrible trademark is off the books. You can't trademark generic terms and force ordinary conversations off the Internet. We're relieved that the urban homesteading community can continue sharing information about their important work without worrying about silly legal threats. Finally the Dark Chapter in Urban Homesteading is over and authors, bloggers and Urban Homesteaders can write about Urban Homesteading knowing that the Derveas Institute's threats have been neutered. Remember the victory gardens talked about above? Those who grew them had a reason to do so - it was patriotic, it gave them something they did not have to use their ration booklets for and they felt good about what they were doing. Let's see what reasons one could have to become an urban homesteader. You know exactly where the food you grow came from and how it was grown. It wasn't with chemical fertilizers on land drenched with weed killer. You feel good because you did it yourself and because it saves money. But I don't have room for a garden! How can I raise food? I have seen gardens no bigger than the size of a double bed that grow lettuce, bush beans, tomatoes and carrots. You can put a container garden on a balcony or a backyard deck. Window sill gardens can grow herbs, leaf lettuce and micro greens. If you have a place to put a few containers and a four foot grow light you can grow produce using the Kratke Method of hydroponics - even in a small apartment. Have you ever thought about landscaping with edible plants? I know someone who plants tomatoes and bush beans instead of just flowers along the front of her home. If you have room for a small tree why not make it a dwarf apple tree? Maybe an apple tree that produces more than one variety of apple! If there is room for two or more trees you can plant a variety of fruit trees, just be sure they are self pollinating. If there is a sidewalk why not line the side walk with everbearing strawberry plants? Even in our part of the country, in a cold northern climate, our everbearing strawberries are blooming and producing right up to the first killing frost. Get a seed catalog and look through it. There are usually pictures of the plants in it. Let your creative juices flow and plan your landscaping to be an edible landscape! I remember watching my grandmother preserve her food by canning the produce from the garden. She had helped Grandad raise three children during the great depression. She would can using both pressure canning and water bath canning. She also froze some of her garden produce. Today, many people do not know how to preserve food for use in the off season. The convenience of the local super market has replaced food preservation for many of us. Some kids today grow up thinking milk comes from the store, not from a cow! It is not unusual for urban homesteaders to raise enough produce that some of it can be preserved for consumption during the winter. Other urban homesteaders will purchase produce at a Farmer's Market from farmers they know that use organic methods. This produce can also be purchased for preservation. Home canning of fruits and tomatoes is safely done with water bath methods. If you planted that apple tree in your yard you may have enough apples to make and can applesauce. With a little more room for trees and a couple of peach trees you can home can peaches. Home grown or purchased from a Farmer's Market, vegetables can be preserved using Pressure Canning. A common vegetable to pressure can is beans, any variety of beans that you like. If you have the room for a freezer you can also freeze both fruits and vegetables. Strawberries, blueberries, raspberries, and blackberries are preserved best by freezing. I know someone who has blackberry vines as a border on one side of their yard. They make a great edible fence that protects the yard from intruders! If you grow cabbage, either in pots, buckets, or raised beds, you can preserve the cabbage as sauerkraut by fermentation. Fermentation is easily learned, does not take a lot of space and is not labor intensive. This kind of sauerkraut is out of this world for flavor and texture compared to the store bought kind. Urban homesteaders strive to get the maximum amount of produce from their gardens, edible landscaping and containers. One of the best ways to get maximum yield is to have nutrient rich soil. Composting is converting garbage into fertilizer. This fertilizer replaces nutrients that were missing or used by the produce that has been planted. As they grow, plants use nutrients from the soil. If these nutrients are not replaced the soil soon becomes nutrient poor and subsequent planting of crops will produce less and less yield. Composting is just guiding and using the natural process which decomposes organic waste. Composting is a way to use much of the household garbage to make fertilizer that replaces those nutrients plants need to grow and produce a good harvest. Composting does not take a lot of room, does not need a lot of labor and can give great dividends compared to the time, effort and cost of producing needed fertilizer. Besides replacing nutrients in the soil, compost helps soil to hold moisture and makes the soil easier to work in. Composting can be done in as little as about three square feet. It can be done in a pile, an enclosure made of pallets or blocks or even an enclosure made of wire. If there are small varmints around that might get into the compost you can make compost in an enclosed container. A large plastic or metal trashcan with a lid and holes in the bottom works fine. Add kitchen waste with yard clippings to the compost pile or container and keep it moist. Turn the compost with a pitch fork every two or three weeks. Leaves, old plants, weeds, fruit and veggie trimmings should be added to the compost. If you have chickens, throw the fruit and veggie leftovers into the chicken pen and let them peck and shred them until there is little recognizable left. The added chicken manure also helps the composting. When it is time to fertilize the garden, take the compost from the chicken pen and place it on the garden. Do not put fresh chicken manure on the garden. It is too hot and can burn plants. Before starting your urban homestead, check with the local laws, regulations and any Home Owner Association rules to be sure you do not get into difficulty with your urban homestead endeavors. Some areas have laws or regulations affecting what kind of animals are allowed. Sometimes chickens are allowed as long as there is not a rooster in the flock. Neighbors may not take kindly to a rooster crowing at 5 AM each morning. If you are desiring to be an urban homesteader please consider the neighbors. It is better to be appreciated and be able to convert your neighbors to urban homesteaders than to have them constantly upset with you. Chickens are considered the homesteaders entry level animal for several reasons. They produce manure, eggs and make great compost helpers. Some urban homesteaders raise rabbits in the back yard. Rabbit pens are inexpensive to make and the fertilizer produced is good. Urban homestead kids can make a little money by selling rabbits around Easter. Depending on the area, it may be possible to add a small goat or two to your urban homestead. The goat can help keep the lawn mowed, provide another type of manure and if a female, might provide milk for consumption or use in making homemade cheeses, soaps or lotions. It would be highly unusual for an urban homestead to be able to legally have a cow. A cow usually requires more grazing area than is available in the entire urban yard. Given a choice between a cow and a garden, you are better off choosing the garden. A garden gives much better variety and more food than you would get from one cow. As hard as it is to have a cow on an urban homestead, it is usually harder to have a pig. It would be highly unusual for an urban area to allow a pig. If you tried to keep one, expect the neighbors to recognize the smell and maybe turning you in for having a pig. Two additional ways urban homesteaders can obtain food is by gleaning or foraging. Gleaning is where arrangements are made for urban homesteaders to go to a farm after the produce is harvested for marketing. The farmer allows the gleaners to come in and take what is left for their use. Sometimes a small fee is charged to the gleaners and other times they get to glean for free. As a teenager I used to glean tomatoes after the harvest season ended. Most of the tomatoes left at the end of the season were not the nice round ones stores wanted. They were misshapen and sometimes had hard places on them. However, the price was right - free - and they were just fine for home canning and making salsa! Many times commercial growers of fruit and vegetables allow gleaning at the end of the season. Ask those commercial growers near to where you live and you may find a source of free or extremely low priced produce. This produce will be great to be home canned or frozen and eaten in the off season. Foraging is where you go looking for food in the wilds. In my late teens and early twenties I taught in a Wilderness Survival School in the eastern part of the U.S. One of the reasons that school started was the founder reading stories of hunters who became lost, used up their ammunition and starved to death. Many times those dead hunters were found in the midst of edible plants that could have kept them alive for weeks or longer if they only knew what they were. It pays to study the edible plants that grow in your part of the country. Then go foraging for them, collect them and learn ways to prepare them. Who knows, that knowledge could save your life some day. Today, in the 21 st Century, we have a wide variety of methods of preserving food. There is home canning, freezing, dehydrating, fermenting and even freeze drying. Urban homesteaders can both learn and become proficient in the methods our grandparents used as well as learn new methods they did not even dream of using. Study up on the methods of storing food in a root cellar and you will be surprised with the variety of foods that can be stored and the length of time they would stay fresh. You might not be able to have a root cellar in your yard but someday you might move to a place where a root cellar was possible. If you have a burden to help your fellow man, think about teaching him how to grow and preserve his own food. Remember the old saying: You can give a man a fish and feed him for a day. You can teach a man to fish and feed him for a lifetime. Maybe a modern version of that old saying could be: You can share some garden produce and feed someone for a day. You can teach someone to garden and preserve food and feed them for a lifetime! As an urban homesteader you are in a position to make this world a better place because you were here. I live in an apartment but want to garden. Is there a way I can do that? Remember the victory gardens talked about above? They were planted in any available space in a city. Perhaps your city has a program where a park, vacant area or even the roof tops of some buildings can be used to grow a garden. Do some checking around, call the city hall and ask them if there is a place available to garden. With a little persistence you will likely find a place where you can grow a garden. Water is scare in the city where I live. What can I do to keep a garden watered? There are two basic methods you might be able to use: Using grey water and if it is legal where you live collecting rainwater. There are places where collecting rainwater is not legal so be sure to check first. The simplest way to collect grey water - water from sinks - is to remove the plumbing underneath the sink and place a bucket there to catch the water that drains out. Be careful not to use harsh soaps that might damage plants. Remove the bucket and use it to water plants but not plants with fruit on the ground such as strawberries. Never use water from a toilet. It can contain bacteria that causes serious illness. Water from a toilet is not grey water, it is black water. If collecting rainwater is legal devise a system where the rainwater collects in 55 gallon drums. Rainwater can be used on plants with fruit on the ground such as strawberries. If collecting rain water is illegal here is a way to get water for plants like strawberries. Place a bucket in the tub or shower to catch water while waiting for the temperature to get warm. This water is fresh water and can be used on plants that have fruit on the ground such as strawberries. How Do I Start Urban Homesteading? Start first by looking closely at the yard, patio, apartment or windowsills where you can grow food. The space you have will determine what you can grow. If you have friends or relatives who lived during the great depression, ask them for advice. If you do not have that resource start by reading about how to do urban homesteading. Once you have developed a plan, put it into action. Convert the book learning into urban homesteading skills. If something does not work out like you planned, don't get discouraged. We all learn by doing and improving what we do. Give it a try, you can do it! Suburban homesteading is very similar to urban homesteading. The main difference is many suburban lots are larger than urban lots and restrictions on what animals are allowed tend to be less strict.